A Task for Every Taste ~ Android Forever! Do you like my post titles? You can't tell what the hell I'm posting about, can you? They're like little riddles. 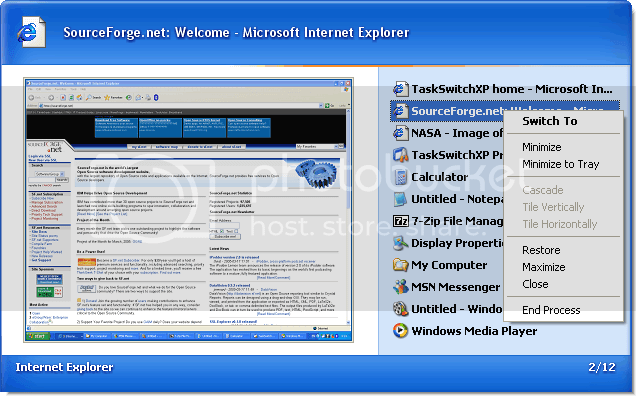 This post is about a great little upgrade to XP's task-switcher. Lifehacker points us to TaskSwitchXP, which replaces XP's sad, but useful task-switch utility. I'm still surprised by how few computer users aren't aware of the easiest way to switch between open Windows. I'm referring to the Alt-Tab keyboard shortcut. If you've got more than one app open in Windows, and you want to switch the computer's focus from one window to another, you don't have to use your mouse to go to the taskbar, find the app you want, then click on it to go to that window. All you need do is hold down the alt key with your thumb and hit the tab key with your pinkie. Each time you hit the tab key, you'll be switching windows...when you get to the one you want, just let go. After a while doing this becomes second nature. Try it. Well, TaskSwitcherXP fancies it up quite a bit, opening up a nice big thumbnail alongside a vertical list of your open apps, where you get some right-click options like Minimize and End Process. Very, very handy.